I struggle with depression, have most of my life, and continue to do so. Matter of fact, I saw a psychiatrist this week and the official diagnosis, again, is Major Depressive Disorder, Severe, Reoccurring. ***Deep Breath*** There, I said it. I told you I’d be transparent, authentic, and raw here. I know in saying this, there is a huge risk that I’ll be judged, sadly more so from the religious community than the secular, but I’m ok with it now. I’m not speaking death over my life, I’m being real. I’m not wallowing in a victim mentality, I’m being authentic. As I’ve processed the idea that God would have me share such a dark, hidden, secret, I know that by bringing it into the light 1) it cannot hide in my life anymore, and 2) if one person is inspired that they are not alone and finds the hope that they can #embracethejourney of healing … well, then it’s worth it. 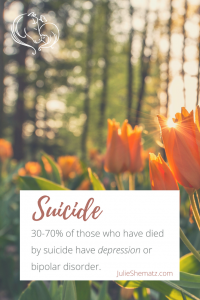 More than 16 million Americans, or 1 in 17, will have at least one major depressive episode a year and I heard earlier this week on Christian radio that there was a 75% increase of suicide rates in teenage girls in 2017! 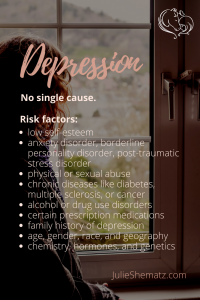 More than 30 million people around the world struggle with depression and 1 in 4 persons in a year can be diagnosed with severe mental illness. Mental instability or lack of wellness (aka illness) is typically onset by stress. We live in an extremely stressful society. and here in the USA we have a serious issue with mental illness and the lack of services to help people recover. Sadly, I think one of the reasons is the entity that has the answers to it, but rarely wants to address it, the Church. It’s the elephant in the middle of the room and I’m chuckling with joy that God would call me to address this. Why is depression the elephant in the middle of the church that is growing like a rapid spreading cancer? I think it’s because it’s attached to the stigma of mental illness and because the Church has cultivated an environment where we, more often than not, maim or kill our wounded, so naturally, people don’t dare confess they are struggling with it. God forbid leaders admit to it, because we all know it will likely result in judgment that they’ve got sin in their life and/or simply not enough faith to be healed. As a result, we have a LOT of wounded people, especially in leadership, that are scared to be transparent or real for fear they will lose their positions in leadership, their friends, or be an outcast … so they are going around hurting, wearing masks with walls around their hearts and most likely hurting others, or keeping themselves so busy that personal relationships suffer and never flourish into what God purposed them to be. God designed us for relationship, healthy relationship. Jesus died for us to have relationship. Intimate, personal, relationship with God, so that in receiving His love we could love others. Problem is that we can’t give what we’ve not received. We’ve likely all experienced being around people that are so busy on their phones or multi-tasking that you are left with the feeling that you simply don’t matter to them. I was one of those people until I had an intern nearly 4 years ago that had the courage to address it with me. It’s been a process to get me to be present in personal relationships and resist the temptation to multi-task, but I took it to heart, and took it to the Lord, over and over while I embraced the journey to be molded into Christ’s likeness. Regardless of how hard it was or how much it hurt, He empowered me to deal with the areas I needed healed, lies I was believing about myself, and replaced them with truth that set me free (John 8:32) to be more present, intentional and a better friend, sister, spiritual mom, and professional helper. People who struggle with being present in relationships, are likely uncomfortable, or worse yet, may be incapable of having real, authentic, and transparent, relationships because of wounds … probably the effects of trauma in their lives. Undealt with trauma, and the effects of it, typically don’t just miraculously disappear, regardless of how many times you’re prayed for, attend anointed services, or declare and decree something that isn’t as if it were, as an act of faith, to be healed emotionally and mentally. Faith without works is dead (James 2:17). Working out our emotional and mental healing is often the process God chooses for us versus the quick fix. It’s a natural response for us as humans to seek the quickest way out of pain because pain demands immediate attention. A more mature approach is to seek God’s redemption in the middle of the pain, asking Him to bring healing into our wounds – which can be a slower process. God does His work in us, pointing us to wholeness, even when we’re in pain, but it’s not simply His work; it is our work too. For the best possible outcomes, emphasis needs to be on resolution, not speed. Resolution puts the effects of trauma in the past, however it requires maturity to embrace the wound (not to imply getting stuck on it), but to invite God’s healing (which is His truth) into it. More often than not, healing, especially emotional and mental, is a process and it, in and of itself can be painful. It’s like peeling an onion. You do it layer by layer and when your eyes are burning and watering so bad you have to step away from it, you do. Then you return to peeling the layers, when the burning and watering have subsided. Each time going deeper and deeper. Furthermore, emotional and mental woundedness is messy … really messy and most people don’t have the patience, grace, experience, or tools to effectively assist emotionally and mentally unhealthy people to heal. Effective, long term, outcomes require spiritual adoption by healthy families and communities and let’s face it, in this fast paced, give it to me quick society … a lot of the church are resorting to the quick stop, prayer line, cast the demons out, now you should be healed, theology. Please don’t misunderstand me, Jesus healed by speaking and immediately people were healed, so did the disciples and the Bible says that we have the same spirit that raised Christ from the dead in us. Furthermore, it says that we will do even greater things than Christ did. However, Paul made reference to asking God to take away a “thorn in his side” repeatedly (2 Cor. 12:7-9) and God didn’t take it away. There have been many speculations as to what that thorn was, but he said that God’s grace was sufficient and he learned to delight in “weakness, in insults, in hardships, in persecutions, an in difficulties”. (v. 10) He learned that God works through weakness. Paul learned to let God be in charge, to let Him take over, and God was able to use him more effectively. I’m letting the Lord take over by being this transparent, and I know depression is NOT in heaven. I have no doubt that it’s God’s perfect will that neither I, nor anyone, battle depression and that we are healed and set free from it. I also know that every cycle I’ve had with the dark monster, it’s driven me closer to God. God’s used it as a tool to get me to pursue Him more, read and study the Word more, pray more, fast more. God uses it to draw me closer to Him because it’s a catalyst that serves to make me super desperate for Him. I also know that God won’t waste ANYTHING we go through (Romans 8:28) and that as we surrender EVERY area of our lives to Him and His Lordship, that He will use it for His glory and even empower us to help others go through what we’ve struggled with. And THAT’S why I’m sharing this. I can’t be real, authentic and transparent without sharing with you what I’m going through. People are searching for the real thing, authentic relationships that aren’t phony, because WE WERE DESIGNED for them. We want to be accepted for who we are and loved unconditionally. God accepts us as we are, loves us unconditionally and wants us to emulate THAT relationship to others. Don’t get me wrong. When facing struggles of any kind, we definitely need to do an inventory on ourselves and verify there isn’t any unconfessed sin or secret sins that are contributing to an open door. The doors need to be closed and secure, and home needs to be in order, meaning we need to be operating in righteousness (not to be confused with self righteousness, which God refers to as filthy rags, aka a pad used for women’s periods!) (Isaiah 64:6 AMP). Generational curses need to be cancelled, unhealthy soulties need to be broken, and most importantly, we need to be feeding our spirits with the Word of God and starving our flesh. We need to be in the world, but not of the world and checking to see what it is we are doing or not doing that might be contributing to this form of oppression. Reality is though, that because of the effects of trauma, there are lies implanted in our identities that need to recognized, rooted out and replaced with the truth that sets us free to be what God has purposed and destined us to be. Those lies are the dross that God brings to the surface that He wants to scrape away. It’s about working out our salvation (Phil 2:12), transforming our minds (Romans 12:2) into the likeness of the Word of God, which is God (John 1:1). It’s a process that as we commit to embracing the journey, God is faithful to bring to pass every Word and promise He’s given us. (Isaiah 55:11, 2 Cor. 1:20, Phil. 1:6) Does it all happen at once? No way. We couldn’t handle it in this life. More often than not, He takes us through a process of healing … our minds and hearts. I hope that you’ll join me in this process. Healing in isolation isn’t possible because God designed us for relationship and it’s in and through healthy relationships that we experience His love, grace, mercy, forgiveness, and healing. It’s through healthy relationships that we move closer to attaining wholeness in our minds, bodies and spirits. Holistic wellness is critical to wholeness. I’ll save going into that for another blog, as I will be sharing with you keys, strategies, techniques and models that have produced effective outcomes in the process of healing from the effects of trauma. And depression, well I dare say 9 times out of 10, it’s likely due the effect(s) of trauma. Trauma blocks growth. There are two kinds, one that happens from the absence of good things we all need, and the other from bad things that should never happen. Again, topics for another blog that I’ll definitely be unpacking to help you better understand it and the effects of it, so that WE CAN BE HEALED. What’s important now is that you know that healing is possible. And, though it might be a challenge to comprehend, our healing was achieved over 2000 years ago, when Christ said, “It is finished” (John 19:30). What’s impossible with man, is possible with God (Matt 19:26)! We can do ALL things through Christ (Phil. 4:13) who gives us strength, including healing from the effects of trauma. I’m going to be sharing with you the Life Model because it’s what I consider the most effective model there is of what our Christian lives can be like … what our lives look like when we’re living from the heart Jesus gave us (vs. the wounded one the world has given us). I hope you’ll stay with me and we can #embracethejourney together. What about you? 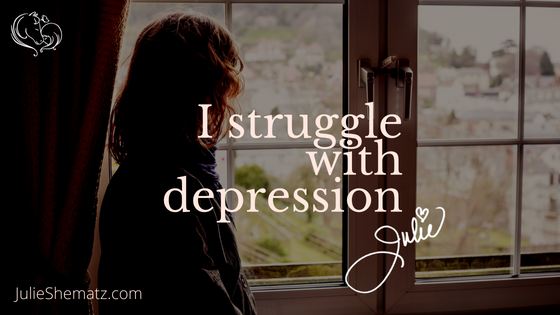 Have you struggled or are you struggling with depression or do you have loved ones that battle it? How do you handle it? I’d love to hear from you. You can email me at julie@beautyfromashes.org if you don’t want to post anything public. I get it … seriously, I do! You can also hit me up on social media (check the links at the top of my page). I invite you to join the movement by hash tagging #embracethejourney #beautyfromashes, #overcomers4FREEdom, and #disciples4FREEdom. Know that I love you and am praying that you invite Christ into your heart and those wounded areas allowing Him to heal you so that you’re set free from all the side effects of trauma. In Jesus name. Amen.